The tenth issue of Mongolica has the following parts: Historiography and Textology, Literature, Folklore, Linguistics, Reviews and Scholaly Life, and Our translations. The articles are written both by competent and young Russian and foreign scholars in the field of Mongolian studies. The essays of the latest scholarly events, reviews of new books make the issue topical. The articles are written in the mainstream of the modern scientific priorities and from the positions of the modern state of Mongolian studies, where historical and cultural problems of Mongolian speaking peoples are very important. They play a significant part in the society and have general historical significance. The issue should be of interest to Mongolists specialising in philology, history, culture, and Orientalists interested in the history of the Mongolian peoples and Central Asia. The specifics of the Mongolian language enables the use of lexical material of Mongolian language as a source for the reconstruction of the ancients’ models of the world. In particular, the article addresses the semantics of the word tsagaan (white) and the symbolism of white in the Mongolian language. The author examines in detail the main characteristics of the space, marked by the lexical definitions in the model of the world. Key words: Mongolian, worldview, spatial-temporal symbolism; properties of space; model of the world, epithet, toponymy, attributive construction. Miniature as literary form is typologically close to Mongolian mentality. Such works present the quintessence of Mongolian people’ cultural and spiritual traditions. The analysis of this genre gives the key to understanding the deep structure of Mongolian literature. Key words: stone, heart, symbol, allegory, harmony, connection. The author examines the history of translation into Mongolian of the collection «The Hundred Thousand Hymns by Milarepa. Key words: Milarepa, Tsannen Kheruka, colophon, namtar, Gurbum, xylographs, Shiregetu Gushi Tsordzhi. The article studies the processes of cumulation in the Mongolian fairy-tales. The author comes to the conclusion that the cumulation in the tales of the Mongols, Buryats and Kalmyks is not a sustainable genre sign, but a compositional technique. Key words: Mongolian, fairy-tales, genre, poetry, cumulation, exposition, function. This article is dedicated to contemporary beliefs of devilry in Mongolia. The article touches upon such matters as the rapport of tradition and mass culture, the transformation of folk plots within modern urban culture, presserving and transformation of demonological tradition within the new social and cultural conditions. The focus of attitude in this research is concentrated on the ghost story-telling — chotgoriin yaria. Author analyses the features of the forming and occurring of these texts in modern Mongolia, the image of demonological character chotgor, as well as the structure of the ghost story-telling, it’s semantics and pragmatics. The article based on the materials and ghost stories collected by the author in 2009 year in Ulan-Bator. Also were used the materials of Russian-Mongolian expeditions (2006—2009, headed by S. Yu. Neklyudov), published sources. Key words: Mongolian folklore and ethnography, demonology, chotgoriin yaria, tradition and mass culture, oral and written text, semantics and pragmatics. The article deals with the main principles of Chinese transcriptions of Mongolian words in the Chinese- Mongolian dictionary Dada yu/Beilu yiyu (late 16th-early 17th cent.). Three such principles are distinguished by the author: 1) the principle of phonetic identity (Chinese and Mongolian phonetic segments completely coincide in their distinctive features); 2) the principle of phonetic substitution in its two varieties: the weak phonetic substitution (Chinese and Mongolian phonetic segments differ in one distinctive feature) and the strong phonetic substitution (Chinese and Mongolian phonetic segments differ in two or more distinctive features, being rather far from each other for their articulation); 3) the principle of zero marking (Mongolian phonetic segments are not represented at all in the Chinese transcription because of the impossibility of their rendering into Chinese). The influence of different stages of the phonetic evolution of Chinese on the dictionary’s system of transcriptions is also emphasized, such as standard Chinese, Late Ming Guanhua, and Ancient Mandarin. Key words: Chinese-Mongolian lexicography, the Mongolic languages, Middle Mongolian, Chinese, historical phonology, linguistics, textology. The author investigates the questions of foimation of long vowels in Mongolian language on the basis of modern linguistics theories. Key words: phoneme, vocalic, tone eurhythmics, diphthong, hiatus, syllable, mora. This article describes the cultural phenomen of Dayan Derkh - one of the most important places of Mongolia - Prikhubsugulie, where various Mongol peoples live since ancient times. The author analyzes the anthem written by one of the experts on these places - L. Galbaabadra. This anthem devoted to the phenomenon for the first time. Folklore origin of the anthem and communication with the later cultural and religious traditions of the Mongols are proved in the article. Key words: Prikhubsugulie Dayan Derkh, traditions, folklore, myths, Mongols, Buryats, the anthem. The article describes the establishment of Tangut-Tatar boundaries, organization of border guard service during the times of Genghis Khan, as well as the war against Xia and Jin states. Key words: kingdom of Xi Xia, New Laws, border, guards, Tanguts, Tatars, Uighurs, legislation. The article is dedicated to two manuscripts of the biography of Gampopa Dagpo Lkhadzhe, Milarepa’s disciple, the actual founder of the tradition of Dagpo Kagyu. The manuscripts are translated by S. Shagzha - famous Mongol philologist, calligrapher, expert in Tibetan language and author of dictionaries and textbooks. Key words: Gampopa Dagpo Lkhadzhe, Sangazhavyn Shagzha, manuscript, Crystal Mirror of the Philosophical Systems, Mongolian, manuscripts, xylographs, textual analysis, translation, biography. This article is dedicated to the collection of the woodcut boards of the State Hermitage. The author comes to the conclusion that the boards contain the traditional Buddhist texts, translated into Mongolian. Key words: the State Hermitage, collection, woodcut boards, Buddhist texts. The paper published the original text and Russian translation of the letter of Pope Innocent IV to the Golden Horde Khan Sartaq. The letter was written after his arrival in Rome Ambassador Sartaq’s with the news of the adoption of Christianity by Khan and part of his subjects. The fact of the arrival of the ambassador to Pope confirmed the biographer of Innocent IV Niccolo da Calvi. The adoption of Christianity by Sartaq reported as other sources, including the Armenian, Syrian and Persian. Key words: Pope Innocent IV, Khan Sartaq, letter, the adoption of Christianity, Nestorianism. The article deals with the content of the «poem» on birch bark found near the village of Podgornoe, Engels district, Saratov region in the Golden Horde medieval burial. The author discovers in the text of the “poem” encrypted symbols and images of the shaman rituals of conducting souls to the other world. Key words: the Golden Horde, burial, manuscript, shaman, incantation. The article describes the fight between various Buddhist schools, the role and achievements in this struggle of Tsogtu-khuntaidzhi - the activist, who opposed the movement of the yellow hats (one of schools of Buddhism), and his followers. Key words: Tsogtu-khuntaidzhi, Agvandamba, monastery, Tibet, the Khalkha, history, Mongolia, Buryatia. The article examines the international activities of the Tibetan Hierarch Panchen Lama IX in 1926-1937, who was in opposition to the Dalai Lama XIII, their impact on the foreign policy of Mongolia and Inner Mongolia and on the relationship with the Soviet Union. Key words: Panchen Lama, the Kuomintang, Mukden government, Inner Mongolia, Mongolia, Tibet, the Dalai Lama XIII, Japan, the USSR, the clergy, politics. The author of this article first briefly describes the archival and manuscript materials of the main depositories of Russia relating to all aspects of life of the Mongolian people. 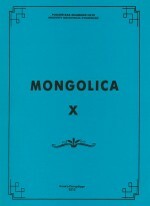 The author offers a description of the materials about political and economic situation, culture, Ethnography, religion of Mongols, Kalmyk, Buryat, as well as contacts of Russia and Mongolia for many centuries of interaction between our States contained in archives and manuscript funds of Russia. Key words: Mongols, Buryats, Kalmyks, archives, Russia, Fund, description, catalogue.